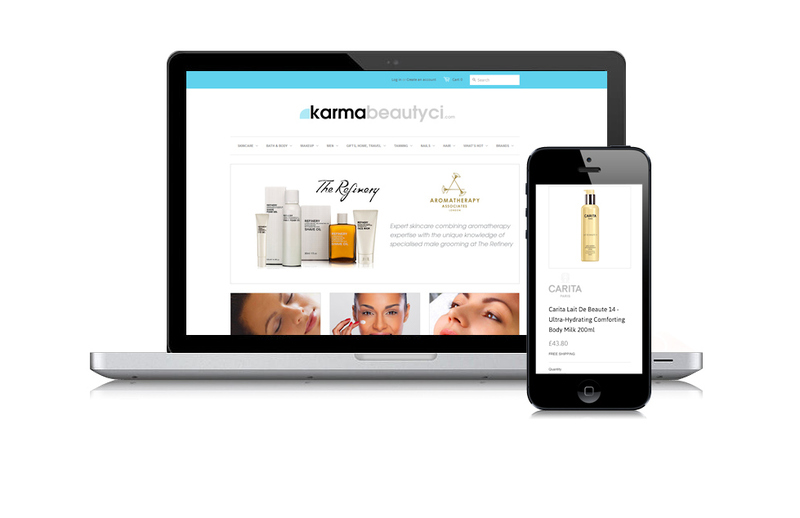 I was approached by Karma Beauty to redesign their website. 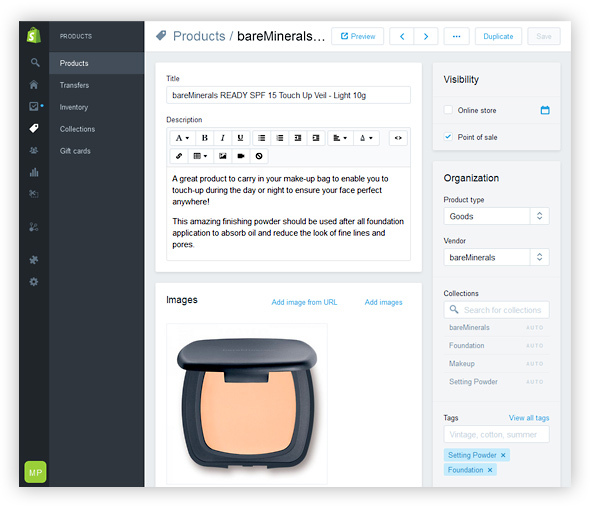 The website required e-commerce functionality in order to sell their wide range of beauty products online as well as give information and allow customers to book sessions in their Guernsey based salon. Click here to view the Karma Beauty Guernsey Website. If you’re starting a new business or upgrading an existing website, I strongly recommend using Web Design Guernsey. Matt is friendly, knowledgeable, and dedicated to producing a high quality website. Matt is always available to answer questions, make improvements, and is a great help running and looking after our PPC activity. 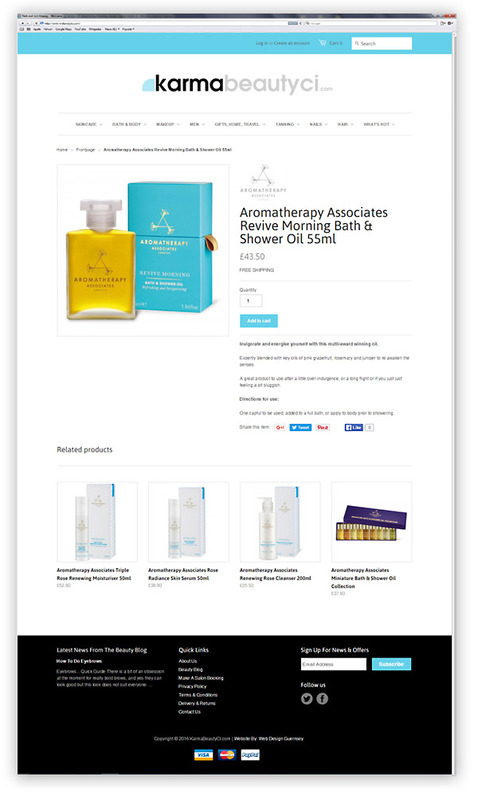 The website design and layout needed to be elegant in order to correctly reflect the beauty products that Karma sell. I opted to go with a plain white background which incorporated the light blue colour used in their existing logo. I contrasted this with a bold black footer which contains links to the main areas of their website and also their blog (which acts as a fantastic magnet from an SEO perspective). The site also makes use of bold flat colours which is really a style that is in vogue with websites in the beauty industry right now. I wanted to keep the design simple so that customers can easily shop for the products they want in the most straight forward way possible. Distractions are minimal making for a simple customer journey and an enviable e-commerce conversion rate. It’s all very well having a fantastic e-commerce website, but it’s not all that great if you don’t drive any traffic to it in order to generate sales. Getting traffic to your website is one of the most common oversights when people launch a new web site. Paid search or Pay Per Click (PPC) advertising is one of the most effective ways of getting people to your website, but can be incredibly expensive if you don’t know what you are doing. 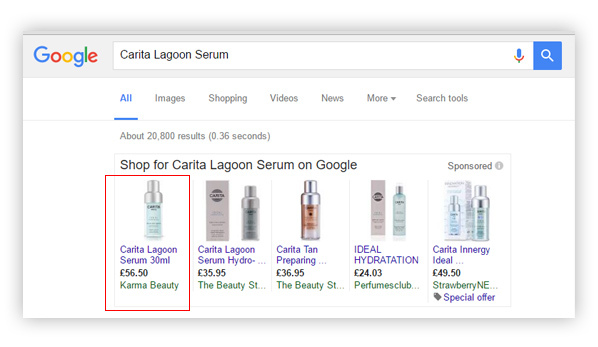 I was asked to review the paid search activity for Karma Beauty. By completely restructuring the account and making use of Google Shopping (PLA adverts) I was able slash the amount they were spending monthly whilst at the same time driving triple digit growth percentage in terms of sales and revenue whilst at the same time vastly reducing the cost per order (CPO or CPA) and making a dramatic improvement to the e-commerce conversion rate. I now manage all of their paid search activity ensuring ROI is maximised and deliver monthly performance reports as well as ongoing Google AdWords account suggestions. I built the website on the popular and secure e-commerce platform Shopify. Security is of paramount importance when performing transactions and selling online. The site can be updated by the team at Karma with no expertise in html or coding required. They are able to update and add new products, categories or brands to the site as well as browse and fulfill orders all through the easy to use content management system. In addition to a new website I was asked to redesign their logo. 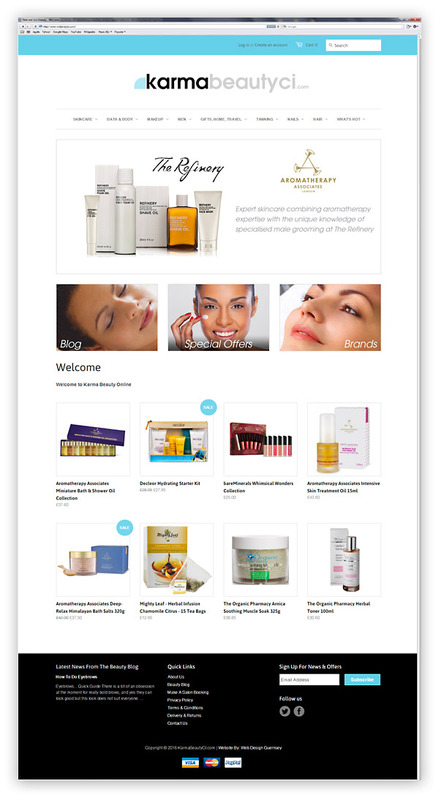 The design I came up with fits in with the new look and feel of the site and follows the design cues from contemporary beauty brands.